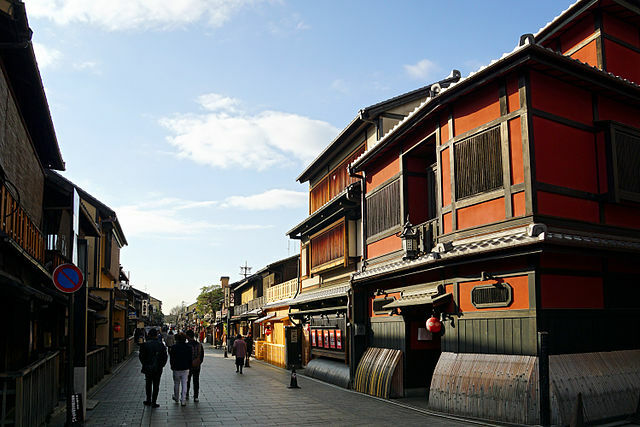 Gion is a district of Kyoto, originally developed in the middle ages, in front of Yasaka Shrine. The district was built to accommodate the needs of travelers and visitors to the shrine. It eventually evolved to become one of the most exclusive and well-known geisha districts in all of Japan. Gion remains dotted with shops, restaurants and old-style Japanese houses called machiya, which roughly means "townhouse", some of which are ochaya or "tea houses". These are traditional establishments where the patrons of Gion from the samurai of old to modern-day businessmen have been entertained by geiko "Kyoto dialect for geisha" in an exclusive manner for centuries. The most popular area of Gion is Hanami-koji Street from Shijo Avenue to Kenninji Temple. Hanami-koji Street is lined with preserved machiya houses many of which now function as restaurants, serving Kyoto style Kaiseki Ryori and other types of local and international meals. 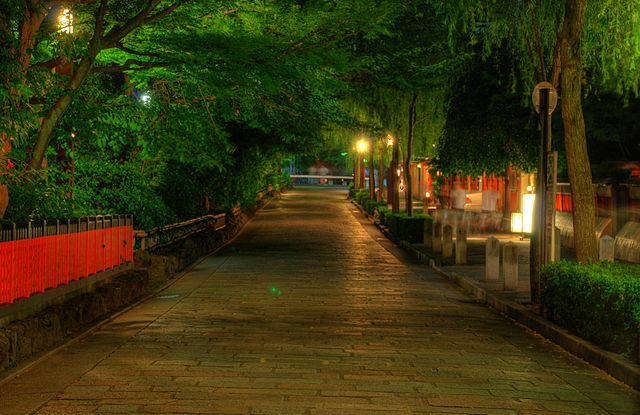 The flagstone-paved streets and traditional buildings of the Gion district, located to the north-west of Kiyomizu-dera, are where you're most likely to see geishas in Kyoto, scurrying between buildings or slipping into a taxi. At the eastern end of Shijo-dori, at the edge of Gion, Yasaka is the shrine responsible for Kyoto's main festival - the Gion Matsuri. The shrine is small in comparison with many in Kyoto, but it boasts an impressive display of lanterns. 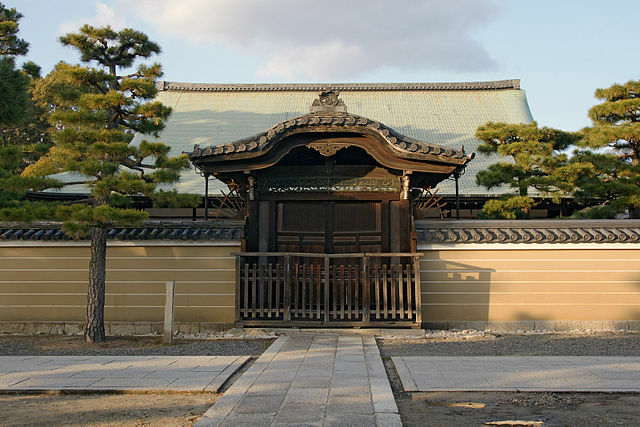 Kennin-ji, a historic Zen Buddhist temple, is located at the end of Hanami-koji Street. It is considered to be one of the so-called Kyoto Gozan or "five most important Zen temples of Kyoto". Kennin-ji Temple is a large temple complex that has handsome halls and sand and moss gardens, and is of particular interest to art lovers. ​You can walk around much of this temple complex free of charge, but some of the smaller sub-temples are closed to the public, and to enter the main buildings "the Hojo and Hatto buildings" you should pay a small fee. The Gion Mutsuri is the biggest festival in Kyoto and one of the most famous annual events in Japan. 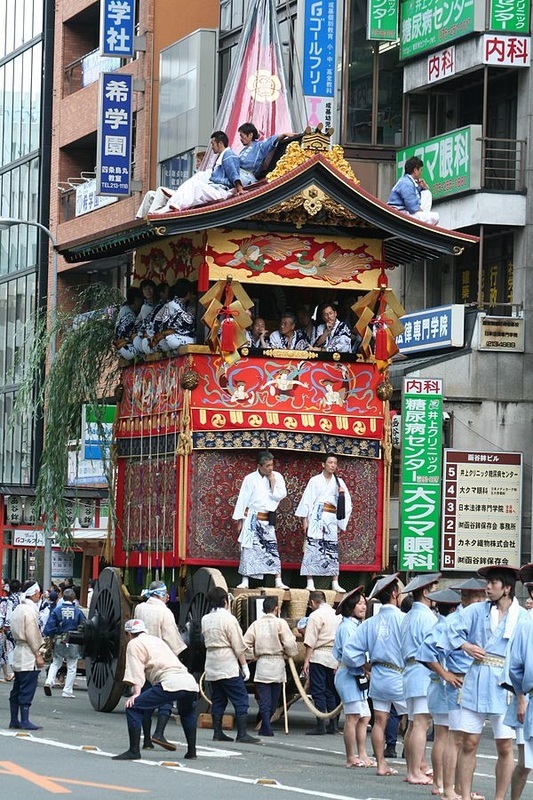 The Gion Matsuri gives you the chance to see spectacular festival floats and traditional Japanese performances. There are a total of 32 floats consisting of two different types called Yama and Hoko, which together are commonly called Yamaboko. 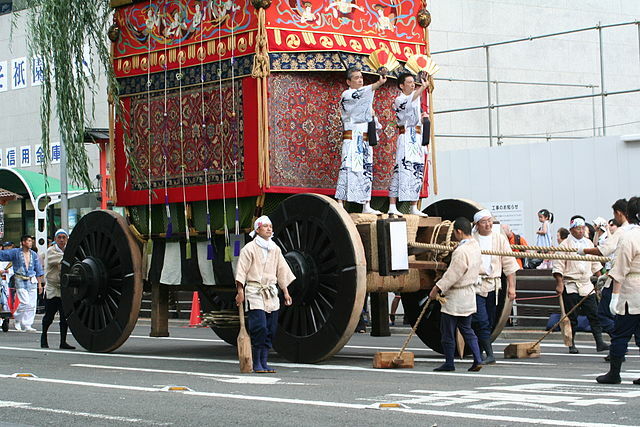 In general, the Hoko are larger, up to 25 meters tall, weigh up to 12 tons, and are pulled on wheels as big as people. The 23 Yama are generally smaller and feature a pine tree. 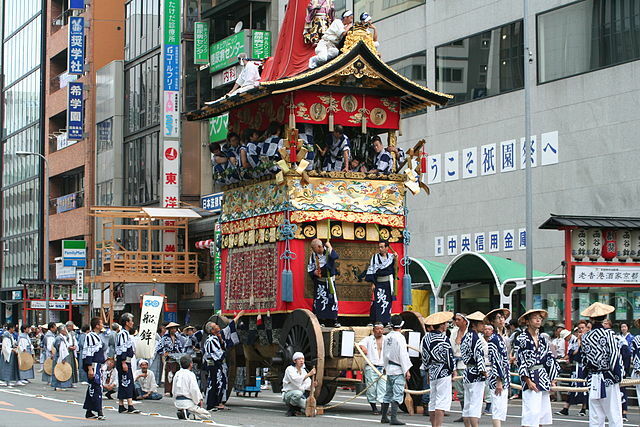 Gion Mutsuri takes place over the entire month of July and is crowned by a parade, the Yamaboko Junko on July 17 and July 24. The highlight events of Gion Matsuri do not actually take place in the Gion district, but rather on the opposite side of Kamo River. Kyoto's downtown area is reserved for pedestrian traffic "18:00 until 23:00" on the three nights leading up to the massive parade. These nights are known as Yoiyama on July 16 and July 23, Yoiyoiyama on July 15 and July 22, and Yoiyoiyoiyama on July 14 and July 21. 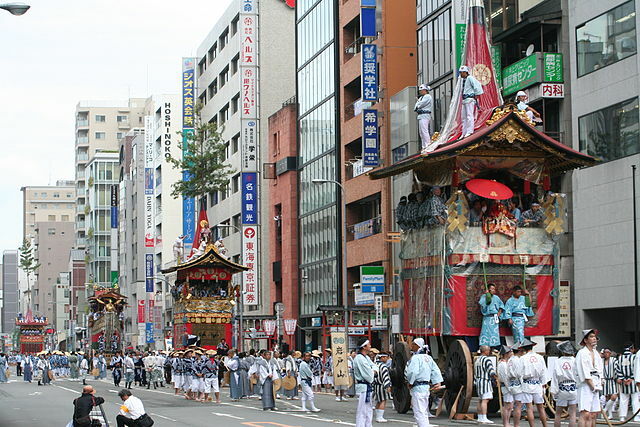 During the 3 days preceding the procession, the respective Yama and Hoko are displayed within about a half kilometer of the intersection of Karasuma and Shijo streets. 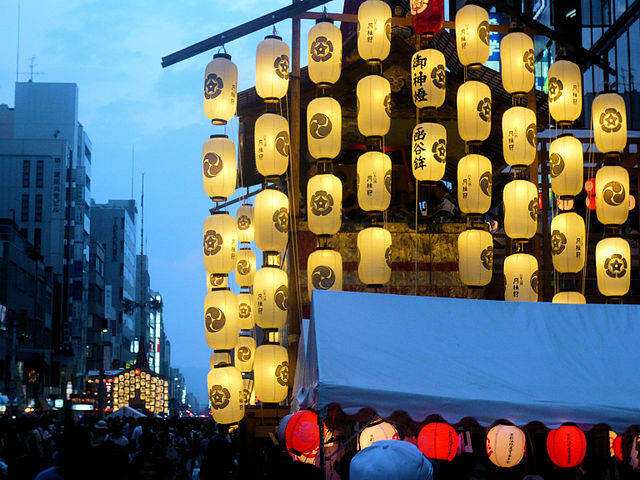 The streets are lined with night stalls selling food and traditional Japanese sweets. Many girls dressed in Yukata "Summer Kimono" walk around the area, carrying with them traditional purses and paper fans. During the Yoiyama evenings leading up to the parade, some private houses in the old kimono merchant district open their entryways to the public, exhibiting valuable family heirlooms, in a custom known as the Byobu Matsuri, or Folding Screen Festival. This is a precious opportunity to visit and observe traditional Japanese residences of Kyoto. One of the reasons for the festival's impressiveness is its long and almost uninterrupted history. Gion Mutsuri dates back to 869 and originally was a religious ceremony as part of a purification ritual "Goryo-e" to appease the gods during the outbreak of an epidemic. In 869 people were suffering from plague and pestilence when Emperor Seiwa ordered that the people pray to the god of the Yasaka Shrine. This practice was repeated wherever an outbreak occurred. ​In 1533, the Ashikaga Shogunate halted all religious events, but the people protested, stating that they could do without the rituals, but not the procession. This marks the progression into the festival's current form. ​Both Yama and Hoko are elaborately decorated and represent unique themes. The diverse tapestries adorning the 32 Gion Festival Float exteriors represent a globally rare selection. ​In the late 16th and 17th centuries the wealthy citizens of Kyoto, mostly textile dealers and artisans vied with one another in purchasing luxurious imported textiles, some Chinese, some Persian and Indian, in order to adorn the huge Gion Festival Floats. For instance, among the float trappings are seven Persian carpets. Minami-Kannon-Yama Hozonkai and the Naginata-Boko Hozonkai are among the Neighborhood Float Preservation Associations "Hozonkai", who own Persian carpets. Gion Festival Summary is a brief description in English where you can find more details about Gion Matsuri. 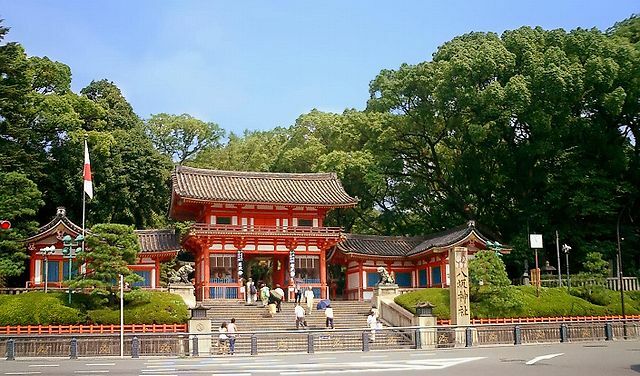 Yasaka Shrine can be accessed in about 5 minutes’ walk from Keihan Gion Shijo Station or about 8 minutes’ walk from Hankyu Kawaramachi Station.